Domino Decisions is an end-to-end marketing performance management platform that helps you achieve smarter, faster marketing. Get 360-degree visibility – whether forecasting future results or evaluating past efforts. Make decisions with confidence – because they’re based on visibility and facts. 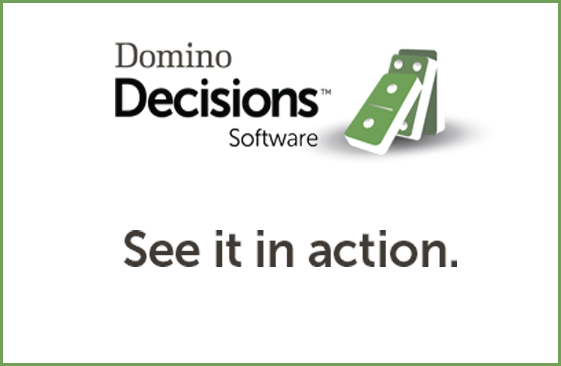 Implement Domino Decisions quickly and easily, with minimal disruption to workflow. The results: your team works more efficiently, and your marketing is more effective – delivering better results for every dollar spent. Understand what your marketing can deliver and has delivered. Quickly gain the power to dynamically predict, measure, and fine-tune your marketing. Increase in efficiency up to 50% throughout your company’s marketing functions. Domino Solutions is an organization focused on making marketing faster and more effective for a broad range of companies. As a trusted guide with years of experience, proprietary models, and best practices systems as its core, Domino Solutions empowers companies with Domino Decisions™ and complementary professional services to ensure business success.